Tired of Athletics Software that underdelivers? So were we. That’s why we created ARMS. See the Difference: Simply take a 30 minute demo and you will understand THE NEW POSSIBLE. 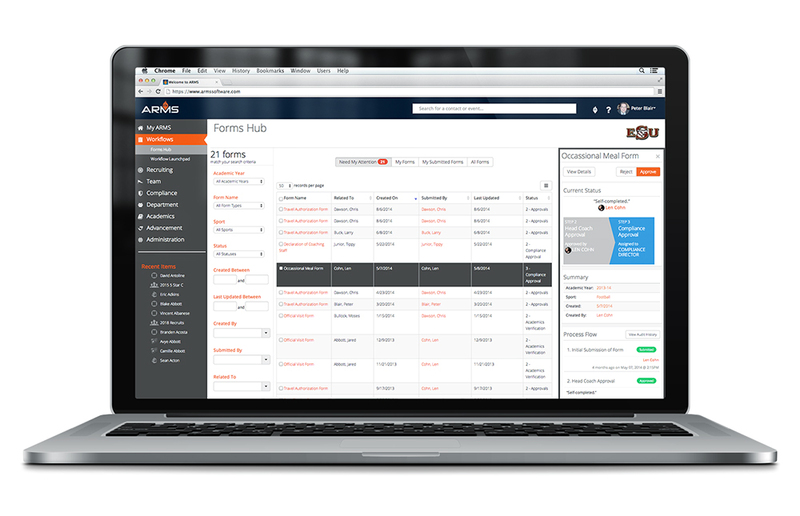 The first and only software solution to truly unify the Athletic Department. Join the army of ARMS coaches who say “Where has this software been my whole career?”. It’s finally here and available to you 24x7x365. Athletics fundraisers have been looking for a way to consolidate all of their efforts and create cohesion between all constituents within the department. It’s finally here with ARMS. 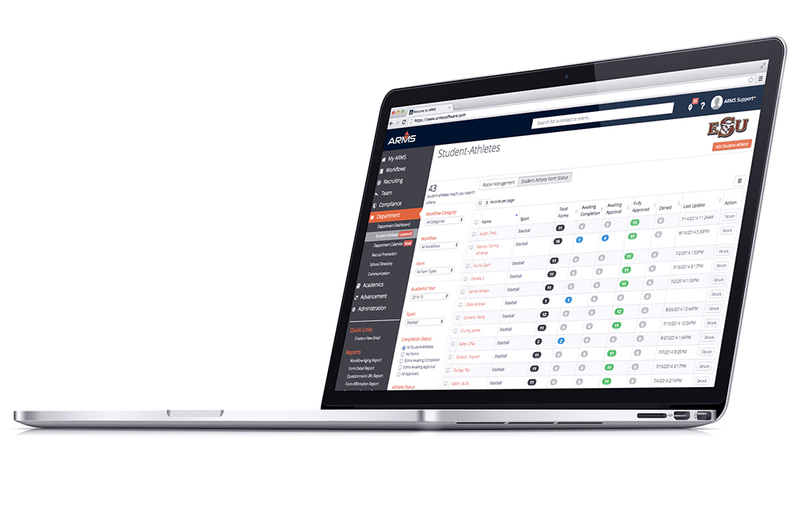 Consolidate student-athlete data, team schedules, completion of departmental processes, academics, financial information, and all other student-athlete data collection and information processes in one place. Don't believe the renewal rates claimed by other providers. Over 90% of our customers switched to ARMS from other software. This is what happened next. One of the most important investments that YOU, the Athletic Director, will ever make. Transparency – Single view consolidation and visibility into communications, schedules, workload, progress, challenges, and successes break down silos between all levels of the athletic department with ARMS Web and ARMS Mobile. Process Automation – Automate every process within the athletic department utilizing ARMS Workflow to create efficiencies never possible before. Athletic Directors can finally unleash the true power of the human resources within the department. Efficiency like Never Before – ARMS is like having an administrative assistant for every person within the department for the cost of a single part-time person per annum. Not to mention all of the paper and supplies that you will instantly save. ARMS is an investment like no other! ARMS is an Investment, Not an Expense – We are all concerned with budget and spending our precious money wisely and rightly so. You may see ARMS as an added expense to your department initially, but will quickly understand that this is an investment with almost immediate returns on so many fronts. True Unification of the Entire Department – Finally an investment that everyone within the department will agree upon. Across the ARMS client base, there is nearly 100% usage across all areas of our client’s department. ARMS will change every constituent’s life within the department including coaches, compliance, business, marketing, advancement, training room, and so many more... and they’ll all be raving about the decision you made to provide this great tool for them to use. Automate the Tactical and Unleash the Strategic Value – ARMS will automate tactical operations within the department from administrators to coaches in a transparent, efficient manner never before possible within college athletics. Implement True Institutional Control – Preemptive monitoring, data collection, and real-time reporting like never before to allow the University’s Board and Administrators to truly understand the you have constant control of the athletic department. Drive Revenue – Utilize real-time, consolidated communications reporting strategies along with real-time data analytics to understand the effectiveness of revenue generating activities. "Implementing ARMS was a very easy decision for us after we saw their presentation and spoke to many of their existing clients. With the transformation of our department, given the addition of football, it has been even more important and all of our coaches across all sports love the product. Every person in our department utilizes ARMS on a daily basis to recruit, manage student-athletes, automate process, facilitate better compliance controls, and drive revenue. We have utilized the real-time data analytics to better determine our success in reaching our constituents, which is having a huge effect on our private revenue generation capabilities. ARMS is a true investment in the future of any athletic department." "I have been working with university administrators and athletic directors for over a decade from both a business and philanthropic perspective. It became abundantly clear to me several years ago that athletic directors, as CEOs of their departments, needed tools as powerful as those available to large company CEOs. With our backgrounds in athletics and high technology, we knew that ARMS could make a huge difference to an industry that had significant needs for software. Our mission at ARMS is to change college athletics administration forever through automation and innovation. We are accomplishing this task one school at a time and can already see the positive effects we are creating for athletic directors across the country." ARMS has become the foundation for the administration of our athletic department over the past several years. Finally, the department that you always knew you could build. You were just waiting for the right tool. "ARMS is a true no-brainer for any athletic department. ARMS has given our department the ability to enhance communication, automate processes, and create transparency and auditability that was impossible to obtain before we implemented ARMS. There is no software product in the college athletics industry that has the ability to transform the business of a department like ARMS. It has truly been a transformational investment for us." 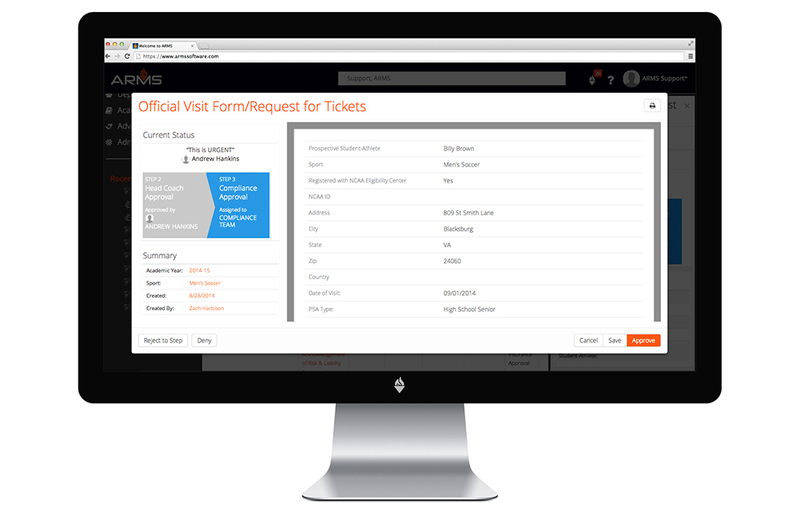 ARMS Workflow – Automate every process within the athletic department utilizing electronic forms and intelligent approval routing to create efficiencies never possible before. Automate travel approvals, budget creation and review, and any process that you use paper for today. Automated Approvals and Routing of Information – Completely eliminate the need to process paper throughout the department with ARMS Workflow’s automated approvals and routing of any process within the department. Customizable, Conditional Rules Creation – Automate special conditions within business processes instead of relying on manual, error-prone human decisions for special situations like spending approval limits, team-based processes, etc. Create your rule(s) and let ARMS handle the processing through smart automation. Transparency – Single view consolidation and visibility into any and all business processes within the department utilizing ARMS Workflow. Security – Manage roles and user security for information access and workflow responsibilities in a single system. Never worry again about improper access to business information. Auditability – Create a single point of information storage without the use of file cabinets. ARMS creates a complete audit trail by date/time for all business processes and the actions taken during those processes. Authorized athletics personnel and auditors can access historical information in a single location through ARMS. Campus – Choose to integrate specific campus departments into processes or choose to only automate within athletics and continue manual process outside of athletics. It’s your choice since ARMS offers simple to use, real-time reporting, exporting, printing, and email capabilities with any business process. "Our background and expertise was cultivated providing technical solutions for some of the largest companies in the world - companies that had the resources to invest millions of dollars into technical solutions to better their businesses. College athletic departments are in dire need of these same solutions, but even the largest athletic department's budget pales in comparison to the smallest of these Fortune 500 companies. We built ARMS to bridge this gap and create a new possible for athletic departments." Purchasing ARMS was one of the most critical and best decisions that I've been responsible for since coming to VCU. This is what happens when you combine Silicon Valley with Indianapolis. Automated Compliance Simplified – Built-in compliance monitoring systems provide for preventative messaging to coaches regarding potential violations. All recruiting and practice activities are checked through the ARMS automated rules engine flagging potential CARA and recruiting violations for review. PSA and Student-Athlete Management – Customizable recruit and student-athlete profile views create quick snapshots of all the information you need in one screen, including financial aid, academics, eligibility, APP/APR data, etc. Automate Compliance Processes Your Way – ARMS Workflow allows processing tailored to the specific operation of your institution. Interactive playing and practice season dashboard creates unprecedented visualization of each sport’s declared season and practice logs. Game-Changing Process Automation – Real workflow vs just forms. ARMS provides the ability to truly take all of the paper processes out of compliance. Complete Customization – Your department is unique and ARMS gives you the tools to customize your use to best suit your unique needs. Holistic Department Management – ARMS provides an overarching view of your entire departmental activities all centrally located in your departmental dashboard. 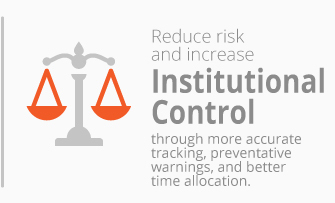 Monitoring Efficiency – ARMS provides efficiencies never before achieved that leads to enhanced institutional control for all administrators. Compliance 24x7x365 – ARMS allows for access from any device 24x7x365. Even when the compliance team is traveling, all parties within the department can access information in real-time from anywhere. "ARMS lifts us out of the day-to-day minutiae allowing us to focus on the important issues. 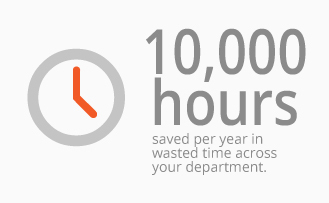 ARMS streamlines and automates almost all of our processes, which makes us far more efficient & effective. The sooner you implement this, the sooner you will begin to see the efficiencies accrue, and the effectiveness of your entire athletic department will benefit. For us at NC State, ARMS has not been transactional, it has been transformational." "I joined ARMS Software because they understand the unique challenges athletic departments face and are the only company in the industry that pushes to innovate in practical ways to improve the work lives of administrators and coaches across the country." ARMS provides a revolutionary approach to holistic, automated department management. 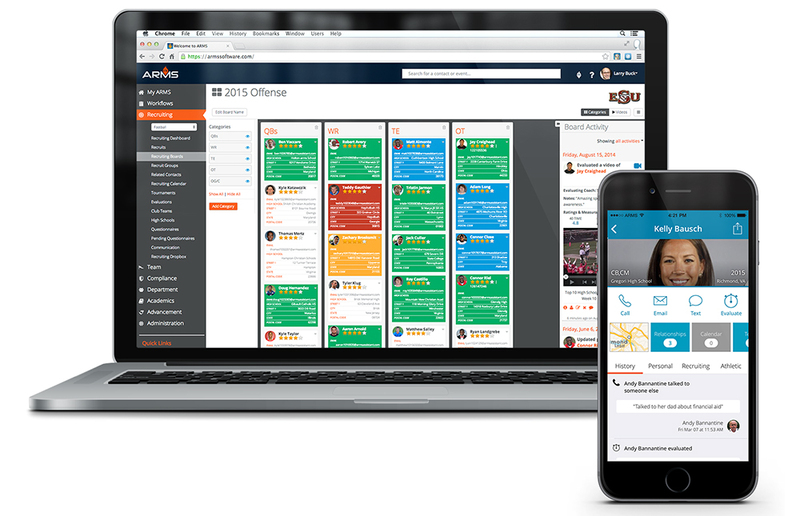 The most powerful, customizable, intuitive tool that has ever been created for college coaches. "ARMS Software is the product that all college coaches have been waiting on. It has a great balance of being innovative while at the same time very simple for coaches to use. I have tried many different products and ARMS is the best on the market." Finally, Tools for Coaches – Are you going to keep making do with outdated, insufficient tools that you’re told to use? ARMS brings the best solution for managing recruiting data, analyzing and evaluating prospects, and communicating at all levels. Collaborate with Your Staff from Anywhere – Whether you’re on the road or in the office, you and your staff are always on the same page with ARMS. ARMS Web and ARMS Mobile provide easy to find information and every recruiting activity in your hand. Communicate and collaborate in real-time with ARMS. Customization – Each program and sport are different and ARMS understands that. ARMS provides limitless options to tailor every aspect of your recruiting process from the data you track, the way you see it, and the way you evaluate. Stop asking if you can customize your experience and start doing it. Communicate with Your Team in Real-Time – Communicate with your team in real-time using email, text, etc. and track analytics on who sees your messaging. Specify Groups Your Way – Need to communicate with specific subsets of your team like by position, class, etc.? ARMS allows complete customization to group your team in any way you want. Manage Calendar, Schedules, etc. – ARMS allows coaches to manage their team’s calendar, schedules, and gives a view into any data associated with your student-athletes. Automate Your Processes – We know you didn’t get into coaching to do paperwork. ARMS will allow you to manage everything you need to complete for the department electronically so you can get back to making your team better. "As a coach, I worked tirelessly to positively affect the lives of young people. But the longer I coached, the more I wanted to positively affect my profession! How we recruit, how we interact with our Athletic Department, these were all areas that needed to be transformed. I joined ARMS because our company gives me the ability to affect that change and transform the way coaches do their jobs. We are creating the tools that help coaches operate in the digital age!" The ARMS product and support team make this the must have software for any coach in any sport. The power to finally maximize private revenue creation by empowering the entire department. Communication Management – Create and track bulk and individual communication with the constituent base including friends, alumni, donors, parents, et al in a single platform utilizing ARMS Advancement. Customizable Real-Time Search and Grouping of Constituents – Search for and group constituents by any criteria or groups of criteria including sport, giving levels, geography, and any other areas of importance to your department to properly build and track relationships. Configurable Custom Campaign Management – Create and track progress against campaigns and goals for each campaign. Electronically Track Pledges – Create and track pledge commitments and fulfillment of those pledges across years and against campaigns, etc. ARMS allows for electronic storage of pledge documents directly within individual constituent profiles for easy access and information sharing. Simple, one-click access to pledge due dates and fulfillment. Electronically Track Gifts – Track gifts in real-time directly within constituent profiles and across the entire department. 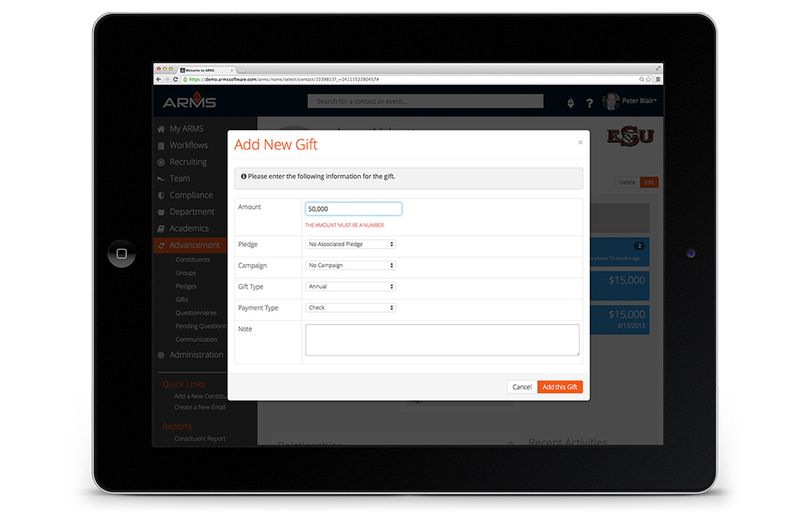 Associate gifts with pledges, campaigns, types of giving, and utilize ARMS Advancement to track customizable giving levels as gifts are realized by year or across years. Mobile Fundraising Sales Team – ARMS allows for access from any device 24x7x365. Even when the sales team is traveling, all parties within the department can access information in real-time from anywhere. "With the ability to move prospects to student-athletes and student-athletes to donors/constituents, ARMS has given our department and coaches the ability to enhance communication and efficiency when dealing with our donors, alumni and other supporters - all while maintaining a detailed constituent history for all. It really has unlimited possibilities from an advancement standpoint." "As a veteran athletics fundraiser for multiple institutions for over a decade, I was always looking for the edge to become more efficient, more effectively communicate the appropriate message to our constituents, and determine the best way to build outstanding relationships across the department. Upon finding ARMS, it became very clear to me that the vision of the ARMS team and its product was going to change college athletics forever." I could not be more pleased with the partnership formed between Georgetown Athletics and the ARMS team. Along with this technology expertise, the ARMS leadership team has been involved in college athletics as student-athletes, administrators, university board members, and major philanthropists for decades. ARMS is the culmination of these experiences and has a singular mission to change the future of college athletics administration forever. ARMS Software is the most innovative, fastest growing technology company in the college athletics industry and is currently working with over 100 university athletic departments across the country with dozens of new clients being added every quarter. Give us 30 minutes and we'll change the direction of your program for the next 30 years.